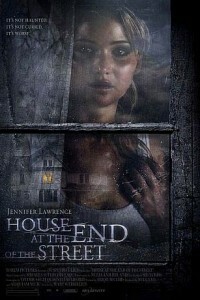 Unfortunately, this is Rated PG-13, so it won’t be as creepy, scary or ‘horror’ible as it could have been had it been Rated R.
A mother (Oscar nominee Elizabeth Shue) and daughter (Oscar nominee Jennifer Lawrence)move into a new community and find themselves next door to a house in which a psychotic young girl murdered her parents. While the locals insist the girl vanished after the brutal murders, the young newcomer befriends the surviving son (Max Theriot) and discovers the sinister story is far from over. From the director of the 1990s movie Hush, which had only one redeeming asset; Oscar winner Jessica Lange. And the writer of Dream House, one of the biggest box office bombs, starring an A-lister (Daniel Craig), of all time.